Relentless Bride® Weddings, Wedding Planning, Life & Marriage: Storkie Invitation Giveaway! When it comes to weddings, the coolest thing to see is how brides and grooms personalize their wedding to make it completely unique to them. Because when it comes to a wedding, you can have the same idea as every other bride and groom, but b/c you make it all about you and yours, it changes the outcome and feel of that same idea... so what better way to personalize your wedding than to start with invitations... And that's where Storkie comes in. Some of these customizable cards can even be blinged out with actual rhinestones!!! HOW FUN! So, I'm super excited to say that Storkie is kindly giving away 20 free invitations to TWO (that's right, two... ) LUCKY Relentless Bride Readers... yup. HOW COOL! 1. Head on over to Storkie Wedding Section. Peruse the site. Make sure to go to the Couture collection Bridal Collection and Play with the customizable features. Note, all invitations are marked recycled paper, blingable, Dynamic Design - so you know which ones you can play with. 3. Make sure to comment here on the Relentless Bride Blog. Ensure there is an easy way to contact you - linkable to your email or leave your email here. 5. You can enter once until March 23, 2010 11:59 EST and this is open to US and Canada peeps! Extra Entry: If you are a tweeter, make sure to follow Relentless Bride and Storkie on Twitter... and Tweet: "I entered the #Relentlessbride @storkie awesome invitation giveaway, Have you? Enter now! http://ow.ly/1l5vO " and leave a comment here!!! If I were to do it again, I would love to say I'd pick the Naughty or Nice invite...if for nothing else just to hear my grandmother say "KELLY ANN!" when she called to RSVP. LOL. I love all the personalization tools. It's great that you can have so much input...it's almost like doing it yourself without actually having to do it yoursel. I love the martini adult birthday invites... because I love martinis! 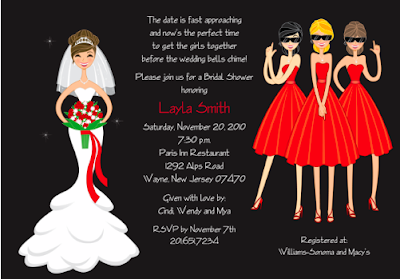 Love the martini bride invitations- would love to throw a bachlorette party using those invites. they would be perfect. the monkeying around baby shower invites are to die for. given all the recent baby announcements by my friend I know these will come in useful! wow i really like the Heart in the Sand invitations! they are so cute, with the beach in the backround, and you can customize the hair! i like it w/ the dark brown hair updo, and medium eyeshadow, and the guy with asian eyes! hahaha! and u can customize the jewelery as well! I like the moving announcements. We've just moved ... so it looks great for us! And the blingability is fun! I love the Grad party invites, and seeing as I'm graduating in May, it'll be the perfect excuse to throw a party! I also love that when you scroll down the invite goes with you, that way you don't have to scroll up. I love the girl w/ blonde hair! So cute. My sister is having a kitchen themed shower for me so if I won these for her, that would really help her out. I like the martini birthday invitations. Just in time for a party!! I would pick Bridal Shower Invitations - Couture Collection → Tea-riffic Bride for my best friend wedding shower! I love how you can customize it as wel.! I gave the bride asian eyes and dark brown hair up! This site is pretty awesome. I LOVE the Hula Bride. I'm probably going to order these anyway, so thanks for the contest! They are awesome and give the feel of a fun bride and bridal shower! Since I'm already married and a baby is the next step - I looked at the baby shower invites. OMG - they are sooo adorable. I love the baby feet (who doesn't love baby feet?) But I really love the couple surrounded by presents because you can change the hair and skin to look like you! How cool! On the wedding invites I love either the Grace or the Modern Hummingbird. I almost can't decide between them! I love the Modern Hummingbird Invitation for a Bridal Shower in the Modern Bridal section. Hummingbirds are a favorite of mine and remind me of my grandmother. I also love the damask look. I love the Gen Couple invite. I love the ELegant Bride :o) So pretty! Storkie Invites are soooo cute!!! 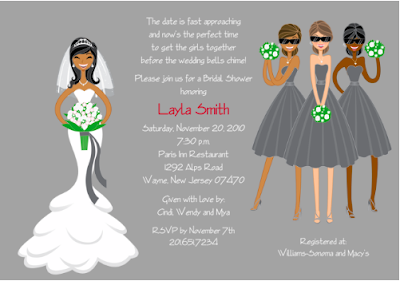 I love the Colorful Elegance Bridal Shower Invitations. I would customize it with cocoa silhouette & black hair. Thanks for a great giveaway! I follow you & Storkie on twitter & I tweeted!